Kevin Dorsey was a solid wide reciever when he played college football for Maryland. After being picked up in the 7th round of the 2013 NFL season he’s awaiting his time to shine and hopefully a solid career of fat paychecks so he can buy more whips. 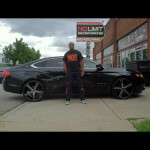 For now, his all new Chevrolet Impala on 20’s will do.